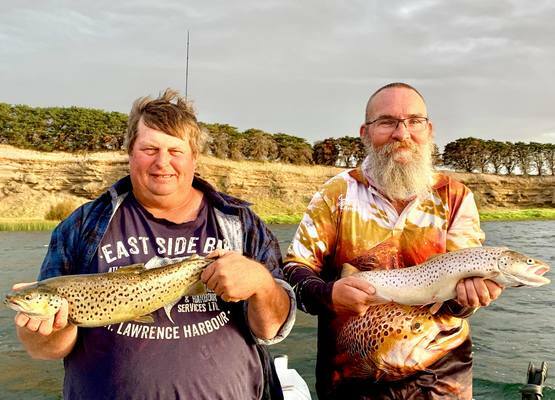 TROUT ABOUT: Shepparton anglers Stuart and Stephen with their recent catch at Lake Purrumbete. With cooler weather well and truly setting in, the trout are starting to bite. Lake Purrumbete saw fish boated by anglers downrigging around 12 to 15 metres down. Charter guide Michael Evans put clients onto quality brown trout and Chinook salmon that engulfed Tassie Devils in gold, pink and silver colours. Other captures were reported by anglers casting lures and floating mudeyes out from the lake’s newly extended jetty. Wurdibuloc Reservoir is now under 40 per cent of capacity but still producing trout and redfin for anglers casting minnow-style lures in the shallow water at first and last light. Casting metal spoon lures into the deeper parts throughout the day also accounted for fish. West Barwon Reservoir had been quiet but makes this week’s report after a number of fish were caught by anglers casting Tassie Devils from the bank and or fishing worms under bubble floats. Brown and rainbow trout to 900g were taken. Portland was again the place to be for anglers in pursuit of bluefin tuna over the magical 100kg mark. Trolling seven to nine-inch skirted lures in 100m of water seemed the most-effective tactic, especially while focusing on areas with diving birds or dolphins. Good bags of squid and whiting were taken across the Bellarine Peninsula from Clifton Springs to Queenscliff. Trelly’s Fishing World’s Peri Stavropoulos headed out with mates Liam and Owen off Clifton Springs on Wednesday night, finding no dramas boating big squid on size-3 jigs in white while drifting in 3m to 4m of water. Fishing out a bit deeper with the use of berley over a moving tide saw whiting caught on squid and pippie as bait. Snapper remained present on the Alcoa spoil grounds, with great reports coming from bait anglers using pilchards. Fishing in 6m while using a lightly weighted bait produced fish to 3kg and lots of pinkies from 23cm to 40cm. Soft plastics are also highly effective on the spoil grounds, with flathead and pike providing likely bycatch.